Grace and I dropped Lydia off downtown at her rehearsal and then drove back through Roxbury and Jamaica Plain, the sun in my eyes the whole time. There must have been something in her voice that invited me, because, without stopping to think or ask permission, I turned and said, “And now I’m taking a picture of you!” I snapped the woman and her companions. The three of them looked over my shoulder as Miranda, the woman with the scarf and sunglasses, dictated her e-mail address to me. Whoosh, I sent the photo to this stranger. “Now, us. We take picture of you.” (I deduced from Miranda’s last name and their way of speaking that their first language was Italian.) I showed them how to use the iPhone camera, and the woman in the black coat took three snaps of Grace and me. The less posed ones — when the woman’s finger slipped on the screen — I like best. We said good-bye and kept walking. Grace and I picked up an ongoing conversation we’ve been having since she was about two years old and met my friend Lisette’s dog, Douglas: what kind of dog does Grace think would be suitable for us? A bundled-up woman with a greyhound in a fleece jacket held her dog as we ambled past her. The dog was jumpy. What? It was the dog, not me. There were ducks walking delicately on the scrim of ice near the shore. One had bright orange feet, the only bit of color. Solitary joggers ran by intermittently. We picked up the pace, wanting to make it around before it got dark, and passed the boathouse, the metal rowboats upturned on a rack. Grace looked out at the pond and took pictures of duck tracks on snow. More joggers. A big poodle, off leash, ran by. Shortly after, so did his owner, a short man calling, “Did you find something, girl? Did you find something?” Indeed, the dog was on a mission, and the man tracked her up the slope. “That dog would be too big for us,” Grace said. And we walked. “Are they talkative, or, um, barkative? I’ve heard that Jack Russell terriers are real yippers,” I said. Meanwhile, Bina lay down at Grace’s feet and presented her belly for rubbing and scratching. Grace rubbed and scratched the white fur. Bina writhed appreciatively. In the car, the radio came on as the engine did. Timbaland sang, “Baby girl, I ain’t got a motorboat but I can float your boat.” We sang along and went home. This was so much fun to read. And Grace has a knack for photography. Beautifully written. I like you. I feel so honored that someone of your stature, who actually lives in Jamaica Plain, would praise this. In all sincerity, thank you. Oh. I just loved reading this. I felt as though I was walking with you and Grace. In your futures something will occur, or something will be heard that will make you reflect back to this perfect winter afternoon and your walk around the pond. Grace, glad you made it impossible for Mom to refuse your invitiation for a walk. I owe the afternoon’s magic to Grace’s spontaneity and insistence. Sweet post. Nice photos. Cute doggies. 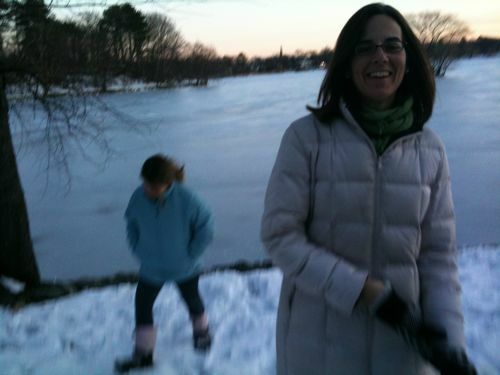 Great memory of a wonderful day on Jamaica Pond. 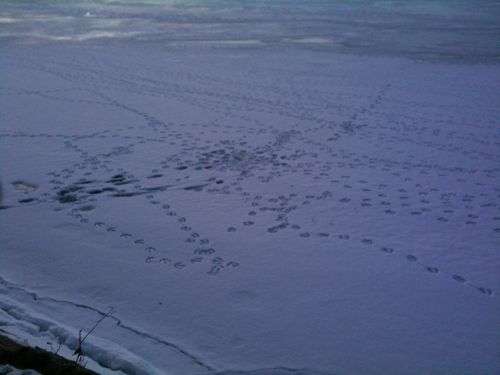 Love the duck tracks photo. 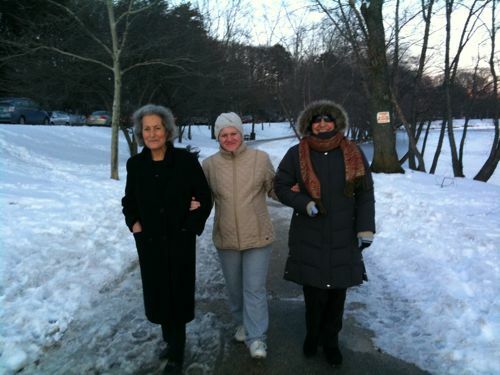 I have looked at the photo several times, thinking of Ellen, Mae and Betty? Did you think of them when looking at it? Lovely, Jane — so evocative, I can see it just reading it. 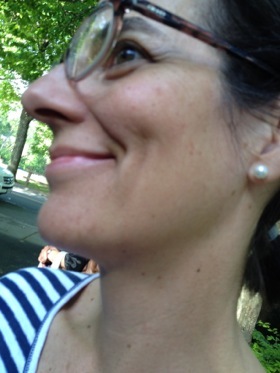 Though the photos certainly help — love the one that Miranda took.